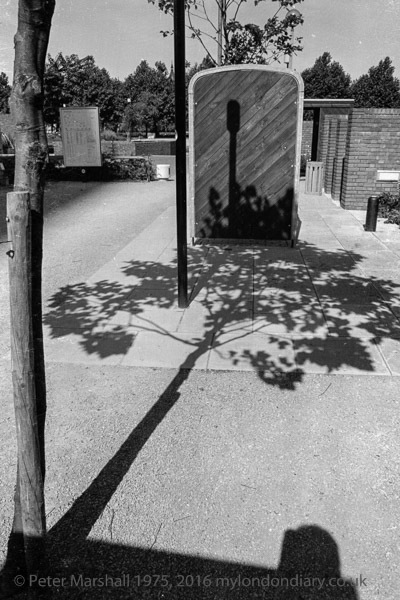 As a photographer who spent a lot of time on the streets I found the street furniture exhibition on what later became a car park to the west of the railway arches going across Belvedere Rd interesting and spent quite a while taking pictures. This neatly horizontal tree was certainly the best of them. At that time an exit from the north end of Waterloo Station led to an elevated walkway across York Road and through the Shell Centre across Belvedere Road taking pedestrians to the South Bank. I suspect had the GLC not been vindictively abolished by Mrs Thatcher it would still be in place and its loss seems a significant if minor loss of the vision of a new post-war London to one where pure commercial interests are supreme. Heavily used then, it would now have been even more so, taking people to the more recent footbridge across the river on the upstream side of the Hungerford Rail Bridge.